Globally renowned Kenyan athlete and UN ambassador Tegla Loroupe will be giving a free talk at the iconic St Mary’s Guildhall in Coventry city centre on Tuesday 5th March. The talk, organised by Coventry University’s Centre for Peace and Reconciliation Studies (CPRS) and sponsored by the Lord Mayor, is set to celebrate the launch of the joint project COKEPI (Coventry-Kenya Peace Initiative) which aims to promote peace-building activities. Dr Loroupe’s sporting successes include three world half-marathon titles, two world marathon records and the impressive achievement of becoming the first African woman to win the New York Marathon. In 2006 the West Pokot-born star was named alongside Roger Federer as a United Nations Ambassador for Sport by Secretary General Kofi Annan, and subsequently travelled with fellow humanitarian activist George Clooney to Beijing and Cairo on a diplomatic mission to end violence in Darfur. The following year she was made Oxfam Ambassador of Sport and Peace to the war-torn Sudanese region. 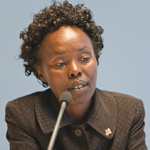 Attendees of Tuesday’s talk will get an intriguing insight into the extensive work Dr Loroupe carries out through her own Tegla Loroupe Peace Foundation, which works predominantly in the border regions of Northern Kenya. For further information, please contact Alex Roache, external press and media relations officer, Coventry University, on 024 7679 5050 or emailalex.roache@coventry.ac.uk.